Yesterday we showed you the twenty biggest records in Chicago during 1966. Here S/Sgt Barry Sadler's had the biggest record of the year with his five week chart-topper "The Ballad Of The Green Beret". Please join us as we recreate 1967 ... exactly as it happened . But first we've got to show you how it got there! Here's how things shaped up here in Chicago as 1966 drew to a close. Notice that The Monkees have the #1 Record on WLS but, for whatever reason, they're showing "Steppin' Stone" as the A-Side of the hit! (This will be the only time the record appears that way in the #1 slot.) The Monkees haven't reached the top the WCFL chart yet … they're showing "Snoopy Vs. The Red Baron" by The Royal Guardsman on top ... and it'll occupy the #1 spot on Super 'CFL for three weeks. 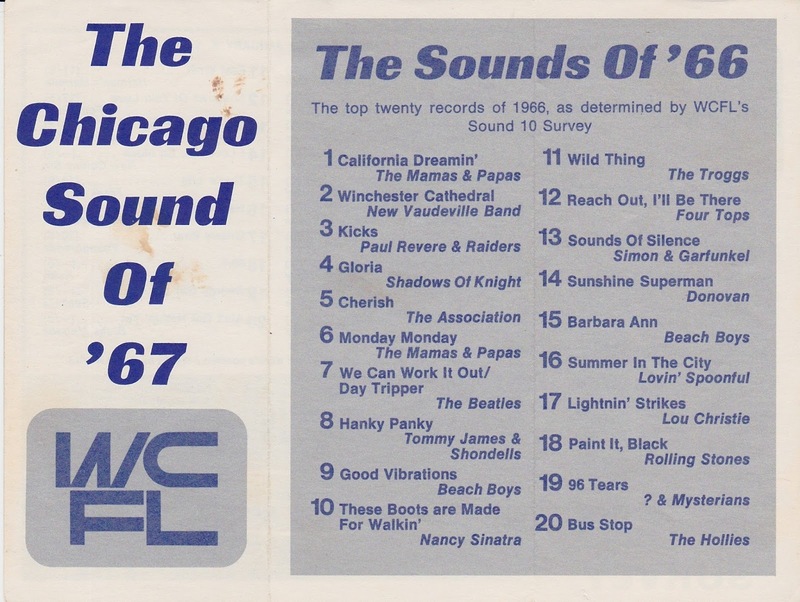 Some of Chicago's Top 20 Records didn't fare nearly as well on the national charts … "Grizzly Bear" by The Youngbloods, "Love You So Much" by The New Colony Six, "There's Got To Be A Word" by Innocence would be prime examples. Both charts offer recaps of The Top 20 Hits of 1966 … but with surprisingly different results. Although 17 titles (18 if you count "Day Tripper" by The Beatles, listed as a two-sided hit on the WCFL chart) appear on both year-end charts, some are in surprisingly different rankings. For example, WCFL shows "California Dreamin'" by The Mamas and the Papas as the biggest hit of 1966 … but it ranks at #6 on the WLS chart. Likewise, WLS' #1 Record of 1966, "Hanky Panky" by Tommy James and the Shondells" only musters a #8 showing on the 'CFL chart. "Kicks" by Paul Revere and the Raiders ranks as both #3 and #9, "96 Tears" by ? and the Mysterians fared better on WLS (#7) than it did on WCFL (#19) and "Sounds Of Silence" by Simon and Garfunkel was either the 8th … or the 13th biggest hit record of the year. Making the WLS list (but not the WCFL chart) are "Last Train To Clarksville" by The Monkees (#14) and "Five O'Clock World" by The Vogues (#19). (Again the balance is off because WLS listed "We Can Work It Out" and "Day Tripper" as separate entries at #11 and #12 respectively). WCFL shows "These Boots Are Made For Walkin'" by Nancy Sinatra at #10, "Reach Out, I'll Be There" by The Four Tops (#12) and "Barbara Ann" by The Beach Boys (#15) … none of these records made the WLS Year-End Top 20. We've come up with the PERFECT way to wrap up this series. It's the SWEET 16 Sixteen!!! And hope that you've enjoyed them, too. And then be prepared to be blown away tomorrow when our BRAND NEW Series kicks off in Forgotten Hits. So please, tell EVERY music fan you know to start hitting The Forgotten Hits Website tomorrow! If you play "Eight Days A Week" twice, that's 16, right??? 50 Years In The Making ... plus literally THOUSANDS of hours this past year alone assembling the final product. So let me thank a few people before the official launch on Friday, December 30th. Thank you to Randy Price, who assembled The Super Charts. FOR THE FIRST TIME ANYWHERE, Forgotten Hits Readers will have the chance to see what I believe to be the most accurate and honest representation of the music AS IT HAPPENED back in 1967. Over the years, we have pointed out the discrepancies of chart positions as tabulated by "The Big Three" national trade publication devoted to presenting this information ... Billboard, Cash Box and Record World. It was not uncommon to find spreads of twenty chart positions between the three magazines. Along the way we learned that, much like payola affected which records got airplay in the late '50's and early '60's, numerous "favors" were granted in exchange for a better chart position ... little things like "buy a full page ad in next week's issue and your record will show up with a bullet and a ten point jump" ... and other practices far more involved. However, the bottom line is each of these publications used their own resources to calculate their chart information. They each polled various radio stations for airplay and popularity, record distributors and record stores for number of units shipped (and number of units purchased) as well as any other number of "secret sources" to determine the relative popularity of any given song or artist. But each of these trades used DIFFERENT sources to gather and tabulate this information. Some factored in actual sales as a higher criteria ... others factored in airplay as being the key determining factor. You will also find the WLS Silver Dollar Survey and The WCFL Sound Ten Survey represented each and every week. 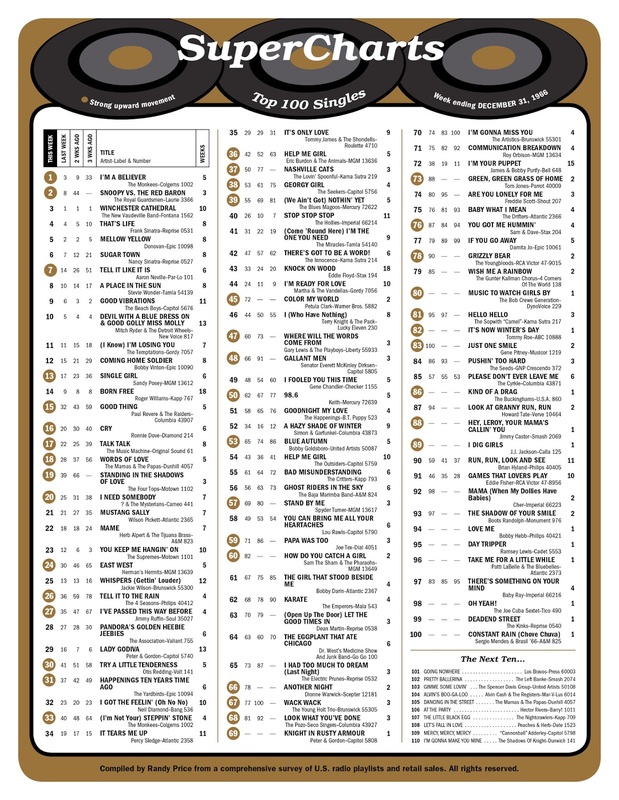 Copies of these charts came from lifelong collector Jack Levin who tediously scanned and sent every single week for both Top 40 Powerhouse 50,000 Watt Radio Stations here in Chicago. 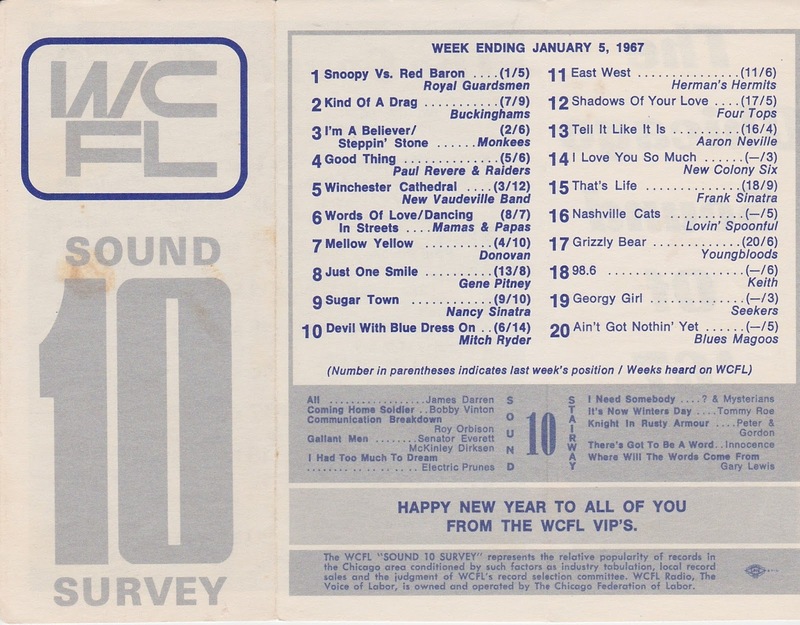 (Due to their clear channel broadcasting, both WLS and WCFL could be picked up at night in nearly every state in the country.) 1967 also happened to be an EXTREMELY good year for Local Talent on our charts ... so you will be able to view the chart performances of many of our Local Heroes like The Buckinghams, The Cryan' Shames, The New Colony Six, The Ides Of March, Spanky And Our Gang, The Mauds, The Riddles and several others. This, too, puts a unique spin on our series as we capture the "local feel" of the charts right alongside the national hit makers. We researched TV Guide listings and websites devoted to programs like The Ed Sullivan Show, Where The Action Is, The Hollywood Palace, The Smothers Brothers Comedy Hour and many, many more to try and present an accurate listing as to who performed what, when and where. Are we still missing some? I'd be shocked if we weren't! But hopefully good response to this series will offer further insight and documentation to help make things more accurate for the future. And thanks, too, to the many deejays who have pledged their support in getting the word out about our brand new series. 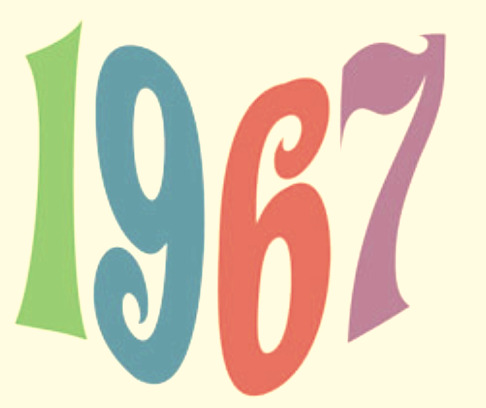 Guys like Scott Shannon, Rick O'Dell, Phil Nee, Allan Sniffen, Rich Appell, Citizen Bill, Mr. C, Lou Simon, Phlash Phelps and many, many more are going to be featuring tidbits from our series throughout the year ... meaning that you're going to get to hear even MORE great music from 1967 as the year unfolds. Please stick around for the ride. A new posting will hit the site EVERY DAY ... from December 30th, 2016 thru January 2nd, 2018, at EXACTLY 6 am Chicago time. We will NOT be sending out reminders for these postings ... we're trusting you to bookmark the site and visit it daily. We can ALL have a really good time with this ... so feel free to comment and share your memories with us. It is for that reason that we're asking you to subscribe to Forgotten Hits. THOSE memories will go out as supplemental emails, typically once or twice a week, to the subscription list only. If you haven't already done so, drop me an email at either forgottenhits@aol.com or kk@forgottenhits.com and ask us to put you on The 67 List. Trust me ... you won't want to miss a thing ... and we encourage you to experience the WHOLE enchiladas!!! Stay tuned ... we're just hours away from the big launch. Please tell everybody you know to jump on The Forgotten Hits '67 Bandwagon. It's gonna be one hell of a ride! Although posting it THIS late, it's practically a Nooner!!! 2016 claimed another superstar victim ... this time on Christmas Day ... when it was announced that George Michael had passed away. 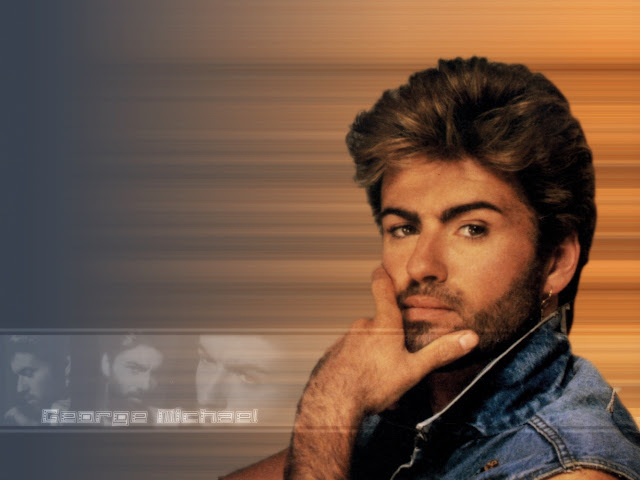 George's life wasn't without controversy ... and the official cause of death won't be announced until after an autopsy. 1985 - Everything She Wants (#1) as WHAM! 1986 - Where Did Your Heart Go? (#50) as WHAM! Recent conversations with Carl Giammarese of The Buckinghams, Jim Peterik of The Ides of March and Ron Onesti of The Arcada Theatre indicate that a Midwestern Tour is definitely in the plans for 2017 ... but several details still need to be worked out. Hope you can tune in for the songs which got the most votes this year, plus some notes on the songs and some fun trivia questions! There will be a pre-show starting at #140 with Allan Sniffen at 10 AM. So, please make a note to join me, Mike Riccio and Bob Radil! Plus, all week long after the show, Rewound Radio will be playing only songs which received votes this year, no matter where they turned up on the list. Hopefully most of you will see this in time to tune in ... and if not, they typically replay the countdown numerous times during the week. Check out www.rewoundradio.com for more details. I heard back in 1967 that the group was originally formed in Dothan, Alabama, by Bobby Goldsboro as The Webs. Roy changed their name to The Candymen after the B-side of his 1961 smash hit "Crying". As a guitarist, Bobby toured with Roy until "See The Funny Little Clown" became a hit and he went solo. 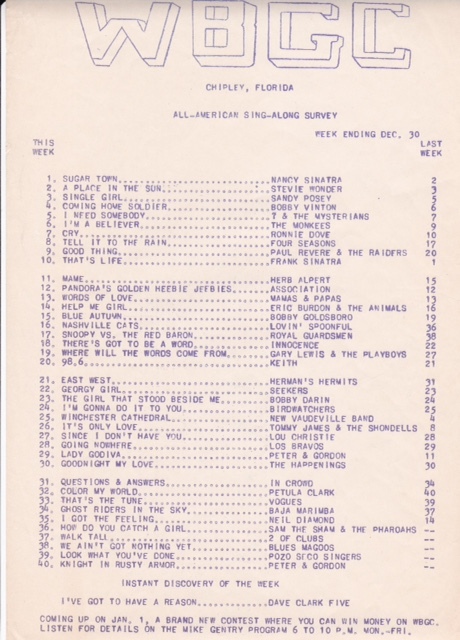 I am enclosing our 1966 year end radio station chart showing Bobby at #15 with "Blue Autumn". Again, I STRONGLY suggest picking up a copy of the new "Where Have All The Pop Stars Gone" (Volume Three) book by Jeff March and Marti Smiley Childs. What I especially like about this edition is that several of the artists featured are cross-referenced because their paths crossed behind the scenes along the way. The formation of The Candymen is well documented ... and you might be surprised about who played in that group over a period of time. I just returned from nine weeks in the U.K., touring with my pal, the amazing Joe Brown ... his most successful tour ever ... just playing ... great tour. Then I played on a benefit for the Musicians Fund in Nashville in honor of my dear friend and my bassist of 30 years, the incomparable Mike Chapman. Mike played on just about every recording Garth Brooks ever made as well as a slew of other country hits. I miss him every day! Then I played a solo show at Lafayette's in Memphis, TN, this past Friday night at what was the best Xmas party! Gonna take it easy for a while and figure out what's next. Hope your having a wonderful holiday.